Ornamental Lily: With bendable leaves for easy and desirable shaping, the realistic look of lily provides classic beauty and understated radiance for instant charm all year round; perfect for adding timeless beauty and elegance to your garden, lawn, flowerbed, etc. 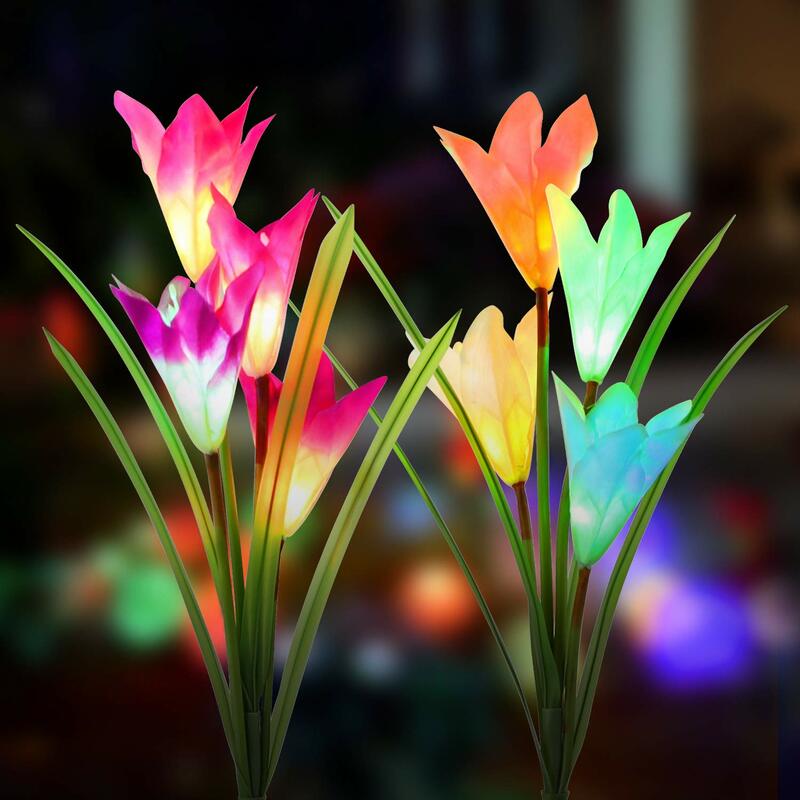 2 Color-changing Lily Lights: Each stake is gracefully crafted with 4 vividly lifelike lilies and features a multi-color LED light in the center of each lily. The light will shine in 7 vibrantly changing colors at night, adding fun and color to your garden at night. Solar Powered: Built-in solar panel stores up solar energy during the day and converts it into color-changing light in the dark; uses free and green solar power to glow with color-changing magic at night; no adapters or cords needed. Auto ON/OFF: The light will automatically turn on in the dark when charged and turn off when ambient brightness is detected or until battery runs out. Let the light charge itself and be a absorbing decoration in the day and illuminate colorfully at night. Long-lasting Durability & Easy Installation: Each lily contains 6 colorfast petals; sturdy stem helps maintain the shape and support the lily structure, making this a great addition to your yard; easy to stake it into the ground, simply let it shine with eye-catching appeal.